Of all of the programs we've been involved with throughout the years, one of the ones we've enjoyed the most is our annual "Words to be Heard" Scholarship Contest. Since 2007, we've awarded more than $100,000 in scholarship money to graduating high school seniors in western and central Pennsylvania. We ask students to create an anti-drunk driving and/or anti-texting and driving proposal (video, short story, visual art piece, or whatever creative idea they have) and have it in the mail and postmarked by Friday, March 25. The grand prize winner will receive $10,000, 2nd place will receive $5,000, and 3rd place will win $2,500. In the meantime, we thought it would be fun to take a look back at some the wonderful entries that have won throughout the years. Emma attended Northwest Pennsylvania Collegiate Academy in Erie and attends Green Mountain College. As soon as we saw Zachary Nimmo's video, we knew it was a winner. It had all of the elements of an impactful PSA: clarity of message, quality, and relevance. We thought that the story in his video unfolded in a way that teens would relate to and immediately recognize as something that could happen to them. Zachary graduated from North Allegheny High School and attends the College of William and Mary. North Allegheny student Katherine Zhou does not beat around the bush in her winning video. "Life is a highway. The lanes are your choices. Where will you go?" Those are the first words that flash on the screen. What follows is a carefully researched and constructed presentation that walks students down two paths – one that involves distracted driving and another that involves safe driving. Joshua graduated from Meyersdale Area High School and attended Slippery Rock University. Each year we're so impressed with the creativity and thoughtfulness that local high school students display, and we look forward to seeing what this year's applicants come up with. 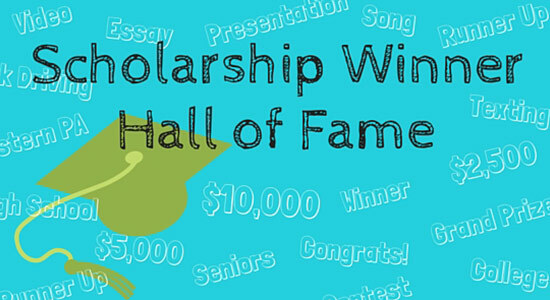 And, if you have any questions about our scholarship contest, feel free to check out our website or email our Marketing Department. We see the tragic consequences of drunk and distracted driving accidents all too often, and it's wonderful to see that so many young people in our region are committed to making a difference and spreading a safe driving message. Thank you to everyone who has taken the time to create "Words to be Heard" throughout the years.